The Bulgarian lands are ancient crossroads. They were populated from remote antiquity and remember many ancient civilizations. The state of Bulgaria has 1300 years old history and according to the statistics it is ranked third (after Greece and Italy) for the number of its archaeological monuments. Ancient Greek historian Herodotus describes the Thracians as the second biggest tribe in the Ancient world, after the Indians. The most famous Thracians were Spartacus and Orpheus. Spartacus was born on the territory of present-day town of Sandanski (south-western Bulgaria) and as an adolescent was sold into slavery in ancient Rome. Later he became the legendary gladiator that led the biggest slave uprising in the Antiquity. Orpheus is known for his incredible talent as a musician and singer. He was born near the present village of Guella in the Rhodope mountain a little before the Trojan war. The legend tells that he was the greatest singer of all time and even the wild animals stopped to listen to his music. Also he took part in the quest of the Argonauts together with Jason and Heracles. The Bulgarians were the basic ethnic component in the structure of the Medieval Bulgarian State. Their original home land was in Central Asia, in the mountainous region of Pamir. As a highly developed civilization they had culturally dominated the territories of central Asia for a long time. In the middle of the 7th century Khan Asparuh united the ancient Thracian nation and the Slavic tribes and founded the mighty Bulgarian Kingdom on the crossroad with Asia and Africa. 1. Bulgaria has a 1322 years of history, since 681 A.D.
2. Bulgaria has harbored and developed culture in 2 alphabets - the Cyrillic (9th century) and the Glagolitic (862), courtesy of Saints Cyril & Methodius (Cyrillic is the basis of most languages spoken in Eastern Europe today). 3. Bulgaria is the first Slavic nations that adopted Christianity. 4. Bulgaria was once one of the 3 biggest empires in Europe among the Frankish, and the Byzantine (it spanned between the Mediterranean, the Black, and the White Seas). 5. Bulgaria preserved its ethnic identity, religion, and culture after 200 years Byzantine and 500 years Turkish yokes! 6. 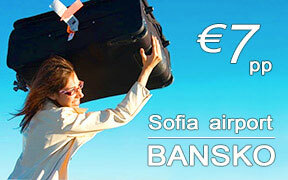 Bulgaria, in its modern history never lost a battle and never lost a flag, captured by its enemies' armies. 7. Bulgaria in its modern history saved the lives of its 50,000-strong Jewish population, despite ill-fated and ill-judged alliance with Nazi Germany! 8. Bulgaria's "Izlel e Delio Haidutin" folk song was sent in deep space on the board of the US Space Probe -Voyager I as part of a collection of our Civilization's finest cultural artifacts - a message to an alien intelligence! 9. Bulgaria gave birth to numerous scientists, artists, and athletes (among whom is John Atanasoff -the inventor of the computer). 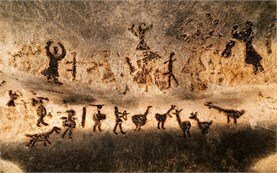 Magura cave - prehistoric paintings presenting hunting scenes, dances, animistic, totemic and pantheistic cult figures form the Glacial Epoch. Seaside Neolithic and Paleolithic cultures - traces found along the southern cost of Black Sea. Most of the remains indicate high level mastery of materials such as china clay, stone, wood, bronze and iron. 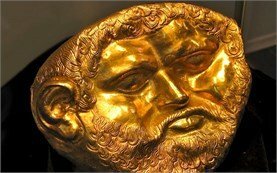 The oldest gold in the world dated 8000 years back is with Thracian origin. 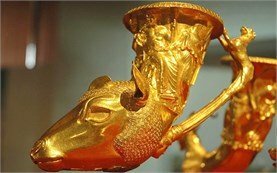 Rogozen treasure - discovered in the winter of 1985-1986 in north-west Bulgaria, is the largest single collection of ancient treasure ever found in south-eastern Europe. The 165 pieces of silver in this hoard weigh almost 20 kilograms and were found in two groups of 100 and 65, placed five meters apart at only 0.4 meters depth. This immense hoard, accumulated over nearly 150 years from the mid-5th century to the last quarter of the 4th century BC, includes vessels from specific workshops in Anatolia, Eastern Greece, Southern Thrace, and North-western Thrace. Panagyurishte treasure - While digging for clay for brick making near the town of Panagyurishte in Sredna Gora mountain, Central Bulgaria, a team of workmen came upon what was obviously an important treasure. When finally unearthed, it was found to consist of a phial and eight rhytons, one shaped like an amphora and the others like heads of women or animals. Dated to the turn of the fourth and third century BC, the find was sensational, not only for its weight in gold - over 6 kg, but also for the originality of its form and ornaments. 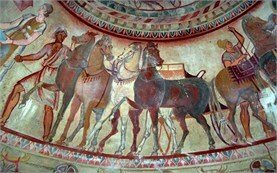 Kazanlak tomb in south Bulgaria is famous for its beautiful wall paintings of the early 3rd century BC, one of the most unique masterpieces of Early Hellenistic pictorial art. Despite the small surface containing the decorative friezes, the unknown artist has created an exceptional work of art. This tomb was built during the reign of king Seuthes III, either for him personally or for close relatives among the nobility. Shipka tomb - include seven tombs recently uncovered in the south foothills of the Balkan Range. They consist of developed facades, each notably different from one another. Not surprisingly, most of these tombs had been robbed in ancient times, with only one remaining untouched by treasure-hunters. Karanovska mound - extremely unique remains of pottery and other household ware dating back to the late Paleolithic and the early Neolithic Ages found near the town of Nova Zagora. Because of that, Karanovska mound is called "the Noah's Ark of the European civilization". Mogilanska mound - yielded in the town of Vratsa, during 1965-1966 excavations in the heart of the city, three stone tombs of noble Thracian chiefs. In the main chamber skeletons of an adult man and a young man were found with two silver jugs, four inscribed phialai, bronze Greek vessels, and arms including a wood quiver (gorythos) with many bronze arrowheads, iron spearheads, a bronze Chalkidian type helmet and a silver-gilt greave (knemis) The younger man, who had been killed by an iron spearhead, wore an elegant gold head wreath, gold earrings, gold buttons, pendants and rosette-shaped appliqués. 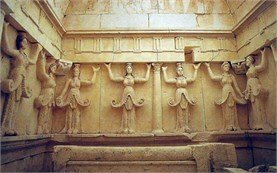 In the third Vratsa tomb, partly robbed in antiquity were skeletons of a man and a woman with gold and silver jugs, gold jewellery, votive clay objects, a quiver with arrowheads, and iron spearheads. The gold jug shows two galloping four-horsed chariots with a man in a hauberk. The dating of the Vratsa tombs, based on several Attic pottery vessels, is about 375-340 BC.